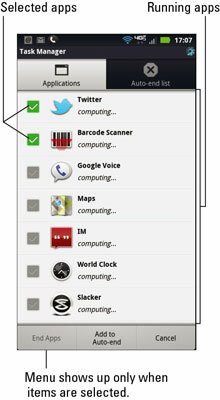 The Droid Bionic Task Manager app is found on the App menu. Its main interface is shown in this figure. You see all the phone’s currently running apps displayed, along with trivial information about each one: The CPU item shows how much processor power the app is consuming, and the RAM item shows how much storage the app occupies. You can use Task Manager to kill off tasks that are hogging up too much CPU time or memory or that just bug the stuffing from your couch. As illustrated in the figure, touch items you want to kill off and then touch the End Apps button. The apps are silently snuffed out. A nifty feature in Task Manager is the Auto-End list. When apps have been assigned to this list, they automatically exit two minutes after the display times out. To add apps to the list, select them from the main screen and touch Add to Auto-End button at the bottom of the screen. Task Manager doesn’t delete apps; it merely stops them from running. To delete an app, use the Android Market. The Android operating system does an excellent job of managing apps. If resources are needed for another app, Android automatically closes any open apps as needed. There’s no need to futz with Task Manager, unless you just enjoy messing with such a thing.